When a female monarch rules for over 63 years, there is bound to be some scandal in association with her reign. 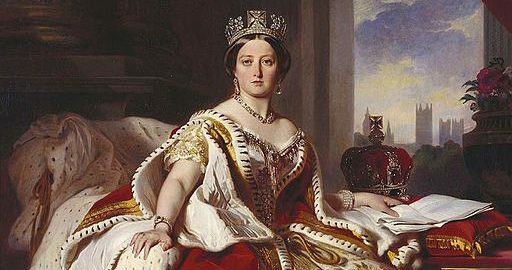 Although Queen Victoria was known for her strict and stringent opinions on moral behavior, her reign, like many of those before and after, is tinged with mystery and social indiscretions. Christened Albert Victor Christian Edward, “Eddy”, Queen Victoria’s grandson, had intrigue and scandal written all over him. His legacy is dubious at best. 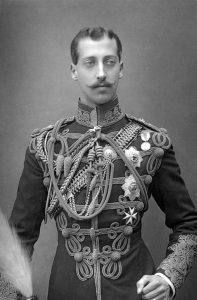 The son of Albert Edward, the Prince of Wales, (who had his own share of mistresses and scandals) and the long suffering Alexandra of Denmark, Eddy was second in line to the throne of England. His education proved difficult as he seemed uninterested in intellectual pursuits. Some explained his lack of intellectual prowess due to possible deafness inherited from his mother, or undiagnosed learning disabilities. At 21 years of age, Eddy attended Trinity College, where he continued to have little interest in the academic life, but made friends such as don Oscar Browning – a man known to favor attractive male undergraduates. Whether Eddy engaged in any sexual experiences at Cambridge is undocumented, but in 1889, Eddy’s became a person of interest in association with the Cleveland Street Scandal. When the police uncovered the all-male house of ill repute on Cleveland street, people associated with the House of Windsor came into question, including Eddy. His father intervened in the investigation and no evidence against Eddy could be found or proven. The next year, Eddy became ill with what may have been venereal disease. Doctors in attendance referred to it as “fever” or “gout.” Rumors spread of Eddy’s intimate relations with a chorus girl of the Gaiety Theater, Lydia Manton and later with chorus girl, Maude Richardson. The royal family reportedly payed off Maude for her silence. Shortly after, Eddy proposed to Princess Mary of Teck, and she accepted to the great relief of the royal family. But, the wedding never happened. Succumbing to the influenza pandemic in 1889-92, Eddy developed pneumonia and died shortly after his 28th birthday. In 1962 the first written mention of Eddy as Jack the Ripper surfaced. The story goes that Eddy fathered a child with a prostitute named Annie Crook. Annie’s friends knew of the scandal, and the Prince, suffering from advanced syphilis and resulting psychosis, brutally murdered them to keep them quiet. 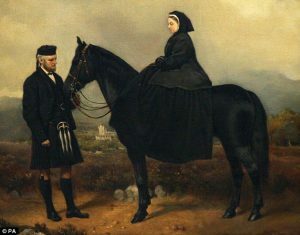 However, records show that at the time of his reported affair with Annie, and the resulting murders, Eddy was at Balmoral, the royal retreat in Scotland, with his grandmother, Queen Victoria, and other family members. Louise excelled in drawing, painting and dancing. Although an artistic career—or any career—was not appropriate for a princess, the queen allowed Louise to attend art school where she learned to sculpt. She later studied at the National Art Training School. Historians assert that Louise had an affair with her brother Leopold’s tutor. Some accounts state she fell in love with the Reverend Robinson Duckworth between the years of 1866-1870. This same reverend, a friend of Lewis Carrol, was the inspiration for Carrol’s character the Duck in the Jury Box and the Duck in the Pool of Tears in “Alice’s Adventures in Wonderland.” Hearing of Louise’s infatuation with a man 14 years her senior, the Queen quickly dismissed him. 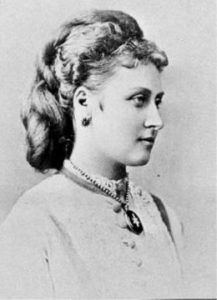 Lucinda Hawksley, in her biography “The Mystery of Princess Louise: Queen Victoria’s Rebellious Daughter,” claims Louise had an affair with the tutor Walter Stirling, and that she actually gave birth to his child—a boy named Henry. She asserts that as soon as Louise gave birth, the queen arranged for the boy’s adoption by the royal gynecologist, Frederick Locock. Hawksley cannot prove this assertion with documentation, but states she has seen photos of the child who bore a remarkable resemblance to the royal family. Louise served as unofficial secretary to her mother from 1966-1871 and worked closely with the queen’s assistant private secretary, Arthur Bigge. Rumors spread that the two also had an affair. Yet, the most scandalous rumor about Louise surfaced at the death of the famed sculptor, Joseph Edgar Boehm. Tales spread about his dying in her arms as they made love. In 1890 Louise married the dashing John Campbell, the Marquess of Lorne and heir to the Dukedom Argyll. The couple traveled extensively together, but throughout the years remained childless and grew apart. Unhappy in her marriage and living away from her husband, Louise became romantically linked with artist Edwin Lutyens, her equerry Colonel William Probert, and an unnamed music master. Louise also supported the suffragist movement, something the queen did not support, and associated socially with Josephine Butler and Elizabeth Garrett. Other friends included the artists Rosetti, Millais, Whister, and Mary Ann Evans, who wrote as George Eliot, and lived with a man out of wedlock. The worst day of Queen Victoria’s life? The day her husband Albert died. 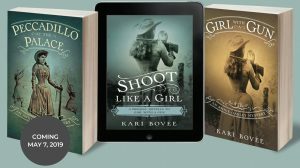 From that day forth, Victoria continued to have his clothes and shaving items laid out for him, and she slept with a plaster cast of his hand next to her bed. For the rest of her days, she wore widow’s weeds— modest dresses of solid black. The second worst day for Victoria? When her loyal servant John Brown died. Brown, a robust, handsome man of more than six feet tall doted upon the queen. He spent hours hand walking her horse as she rode throughout the beautiful grounds of Windsor, Osborn House, and Balmoral. After the death of Albert, Victoria relied on her devoted manservant from Scotland for everything. Victoria’s children referred to him as “mama’s lover” probably due to the fact they slept in adjoining rooms. John Brown served as the queen’s constant companion and he pledged to be with her always. She gave him gifts, created two medals for him, commissioned a portrait of him and had statues and private memorials of him erected after his death. When Victoria passed, her son Edward VII had the statuary destroyed or removed. He also had over 300 letters of his mother’s burned, many of them mentioning Mr. Brown. Speculation that the two secretly wed came about when one of the Queen’s chaplains claimed on his deathbed that he performed the ceremony. There was also talk of three additional children. Premarital relations between John Brown and Victoria, or their possible marriage, has never been proven. However, when Victoria died, she requested a photo of him be placed in her coffin, along with a lock of his hair, some of his letters, and his mother’s wedding ring that he had gifted to her years before. The ring was placed on the third finger of her left hand and was disguised under strategically positioned flowers. Victoria also requested to be buried in her wedding veil, along with Albert’s dressing gown, and the plaster cast of his hand. Did Prince Eddy have a dark side? Did Princess Louise have a child out of wedlock? Did Victoria enjoy friendship, relations, or even marriage to her handsome Scotsman? We may never know. In the case of Victoria, however, I find it interesting that her beloved husband and her devoted servant should have equal status in her voyage to the hereafter. Don’t you?